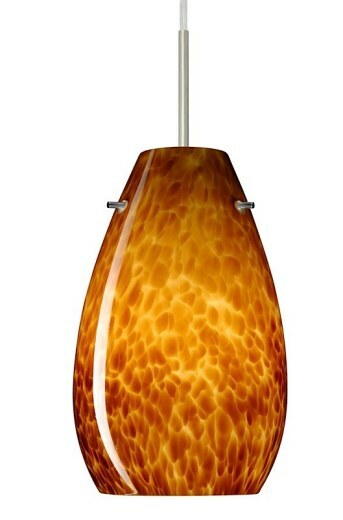 The Pera Mini Pendant has goregous handmade glass diffusers which create a wonderful lighting ambiance in your home. Don't limit these beautiful lights to the kitchen. Unexpected uses of pendant lighting can create wonderful accents throughout your home. Uses one 100W incandescent bulb, not included. Suitable for damp locations (interior use only). Cord Hung Suspension: 10' cord, complete with 5" decorative sleeve at the socketholder. Jacket coordinates with metal finish. Flat canopy. Stem Mount Suspension: 4 connectable stem sections (3", 6", 12", and 18" lengths) plus telescoping piece for up to 3" adjustment, 10' max. 5" diameter canopy (with swivel) and stem sections are plated steel.